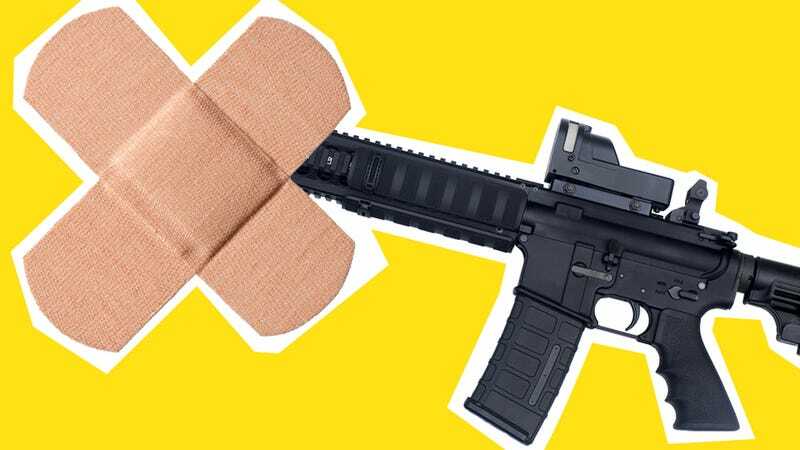 In light of last Friday's tragic school shooting, some people are arguing that gun control is just a band-aid, and that access to mental health services in this country is the real problem. But the thing is, if I cut myself, I'm not going to say, "No, no band-aid for me, thanks! It won't heal the wound completely on its own!" Instead, I will say, "Yes, thank you! The band-aid will alleviate the pressing concern and protect me!" Some people think gun control is a band-aid but you know what? Sometimes band-aids are useful. You've probably read the "I Am Adam Lanza's Mother" piece that was on the front page of the internet yesterday. Writer and teacher Liza Long shares stories about her middle son, whom she calls Michael. Michael suffers from something that causes him to frequently threaten to hurt and kill other people and himself. Long is overwhelmed by her situation, and expresses a deep kinship with Adam Lanza's mother, Nancy, who died at her son's hands early Friday morning before he went on to kill 26 people, 20 of them just six and seven years old, at Sandy Hook elementary school. Obviously, the much bigger issue is that Liza Long is not Adam Lanza's mom. The similarity begins and ends with the having of mentally ill sons. That's all we know, and it's dangerous to assume more than that. We can't lump all people with mental illness together into one big "crazy" pot, it stigmatizes the ill and disconnects us, as a society, from their humanity. Because there are so many mental disorders, we need to leave it up to people who can properly diagnose them to do just that. For those of us who can't — the diagnosis doesn't matter, the danger does. If we find out that Adam Lanza was schizophrenic, it just doesn't matter. We're not going to change the way we medicate all schizophrenics because of this. It's irresponsible to say, "He had this! Liza Long's son has this! People with mental illness are violent! Causation!" Two, three, ten people going on such a rampage — it's a bad indicator of an entire population, it's not statistically significant. I agree that we need to talk about mental health in this country much more than we do, that our system is broken and must be fixed — but the fact is, most people with mental illness are much more likely to be victims of violence than perpetrators of it. Now is not the time for this conversation, now is the time to focus on other things, more urgent things like gun control. Because, you know, gun-related child and teen deaths are a very frequent occurrence. Everyone's so busy trying to figure out exactly what was wrong with Adam Lanza — and that's a discussion to have at some point — but right now we really need to stay focused on gun control, the thing that can stop something like this from happening tomorrow. Because at the rate we're going, that possibility isn't exactly non-existent. In fact, it's basically already happening. Sometimes it's just random acts of violence, sometimes it's being in the wrong place at the wrong time — sometimes it's as simple as being born a certain color. For example, in 2008 and 2009, black children accounted for forty-five percent of all child gun deaths in the United States, despite being only fifteen percent of the child population. Black children suffer from lax gun laws, and they suffer greatly. Need further proof that guns kill kids? As of 2004, every day in the United States, eight children were killed by guns. In 2007, Gary Younge picked a day and reported their stories. Heartbreaking. Yes, we can talk about both guns and mental health, but we must prioritize action on guns — it's concrete, and it's doable today. Guns are a problem, a known commodity, and we must do something about them. We don't know what Adam Lanza's diagnosis is, but we do know that Nancy Lanza kept guns in the house, and quite a few of them, including a Bushmaster .223-caliber rifle,, the AR-15 style assault weapon used in all of the killings (except for his own, in which he used a handgun). Of course, it's available for purchase at Walmart currently. Its slogan? "This gun from Bushmaster will always shoot straight and aim true." Creepily, the banner ad to its right advertises, "Cookie Season Is Here!" Listen, no matter how good a therapist is, no matter what medications a person is on, sometimes people still kill themselves and/or others. Mental health services do need to be improved, but those services can't do it all. Some acts are inexplicable and senseless, and even within a system of excellent mental health care, there will be acts that defy explanation. We need to make it harder for these things to happen. Launching into a conversation about mental health takes away from the issue of gun control, especially in a nation this easily distracted. Especially in a nation this sick. We must focus on what we can fix right now — and if certain politicians and lobbyist groups can put reason ahead of money and selling the snake oil of safety — we can fix things and we can do so fairly quickly. Legislation is already being introduced, the President is already hinting at it. We must ensure that the conversation continues, that change occurs. Yes, we need to have conversations about mental health, but first we need to decelerate the carnage. First we need to put on the band-aid. Image via zimand / Shutterstock.